Mr. Hubs and I are fortunate enough to own a fairly nice sized piece of land, but with Mr. Hubs working as much as he does, and me with a super flexible schedule, I’m the one who does the lawn care. That I quite frankly do not mind, but must have the proper equipment for – and a good pair of pruning shears, that don’t hurt my hands, is highly necessary to maintain our lawn and garden. 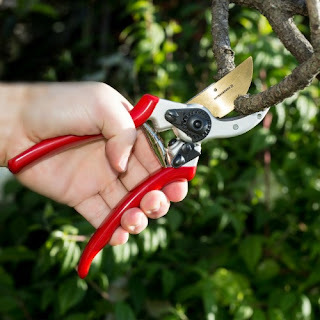 These Titanium Bypass Hand Pruner Pruning Shears by Haus & Garten are easy to use no matter what I have worked on. I tested them out on herbs to see if they would work on the more delicate plants and had no problems. Of course I had to try them out on what most of us use on pruners for … tree branches, rose and other bushes. I have a row of columnar pines that can look very shabby without pruning. I was able to prune my pines with these pruning shears with ease and comfort. The spring action release makes these quick and efficient, but they lock into place when you're not using them so safety is not an issue. These are, by far, the best shears that I used! The Titanium Bypass Hand Pruner Pruning Shears by Haus & Garten list for $58.90 and are currently on sale for $38.90 on Amazon … just in time for gardening season!